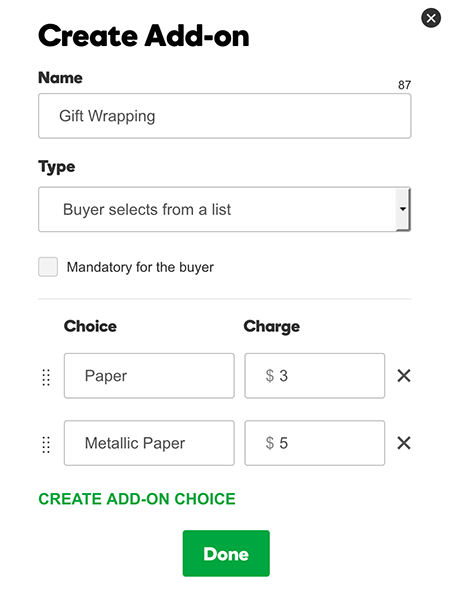 You can add customer service options for a product, such as gift wrapping. 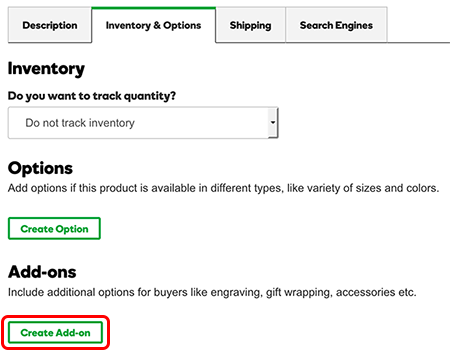 In your products list, click Online Store, and click Manage next to the account you want. Type a Name for the service, such as Gift Wrapping or Delivery. In the Type list, select Buyer selects from a list. Check the Mandatory for the buyer box if you require customers to select the service. Add a choice for the service in the Choice box. To add more choices, click CREATE ADD-ON CHOICE. For example, if you're adding a Gift Wrapping service, the first choice could be "Paper," and the second could be "Metallic Paper". Add a Charge as appropriate. If the customer chooses to add the service, the product's final price includes the increase. Click Done. The service option is added to the Add-ons list.